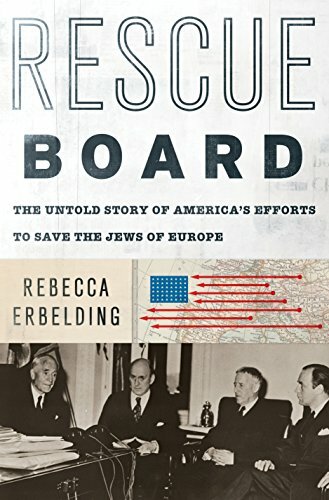 US Holocaust Memorial Museum historian Rebecca Erbelding’s Rescue Board: The Untold Story of America's Efforts to Save the Jews of Europe, based on a decade of research, is the first (non-self-published) study of the War Refugee Board, created by FDR in January 1944 to save the lives of Jews and other persecuted minorities during the Holocaust. Though the WRB’s work has often been relegated to the end of larger tomes of American indifference, Erbelding argues that the WRB staff were passionate and creative, saved tens of thousands of lives, and should be an example for today. Rebecca Erbelding earned her PhD in American history from George Mason University in 2015. She worked as an archivist and curator at the US Holocaust Memorial Museum from 2003-2015, and since 2015, has been a historian for the Museum's upcoming exhibition, Americans and the Holocaust, opening in April 2018. Her first book, Rescue Board: The Untold Story of America's Efforts to Save the Jews of Europe, will be published by Doubleday on April 10, 2018. Her work has previously been featured in the New York Times, the New Yorker, and on the History Channel and National Geographic, largely concerning her 2007 discovery of the personal photo album of Karl Hoecker, the adjutant to the final commandant of the Auschwitz concentration camp. The Washington History Seminar is co-chaired by Eric Arnesen (George Washington University) and Philippa Strum (Woodrow Wilson Center) and is sponsored jointly by the National History Center of the American Historical Association and the Wilson Center's History and Public Policy Program. It meets weekly during the academic year. The seminar thanks the Society for Historians of American Foreign Relations and the George Washington University History Department for their support. © Copyright 2018, The Woodrow Wilson International Center for Scholars, All Rights Reserved.